Shanked one into the lake? Golf ball retrievers are incredibly handy devices that can be used to grab golf balls that have fallen into bushes, hazards or other difficult to reach places on the course. There are several types of golf ball retrievers that you can choose depending on where you are going to use it. There is the ring head, rake head, spring head, extendable, hide away, cupped and teardrop. You will most likely want a golf ball retriever that has a locking head. This helps you secure the golf ball by locking the grip in place which prevents you from dropping the ball. It is important for you to get the best golf ball retriever in order to avoid hassles when playing golf in the field. A cheap one might be more of a problem than a solution as most have very poor grip and traction making you drop the golf ball multiple times. To help you out, we have compiled a list of the top 5 best golf ball retrievers you find online today. Priced at $39.95 (only $29 on Amazon!) the IGotcha “Executive XL” Ball Retriever is one of the most popular products in the market today. It can expand up to 14 feet allowing you to reach even the farthest places. Despite its huge reach, the Executive XL folds into a very manageable and compact size (20 inches), so you can easily store it in the side pocket of our bag. It weighs only about 12oz which adds to the advantages of using this product because of its extremely light weight compared to its size. IGOTCHA Ball Retriever comes in five difference sizes, including the “Biggest” (21 feet reach) and the original “Executive” (14 feet). Overall though, we feel that the Executive XL is the best size/value offered by IGotcha. Pros: Incredible reach with compact and light weight designed. Cons: The grip is slightly complicated to use. Buy the IGOTCHA Ball Retriever here! Another one of the best golf ball retrievers on the market is the Callaway “15th Club” Ball Retriever. It is priced amazingly well at only $27.99 (on Amazon). It can be retracted down to a miniscule 45 inches and extends up to 15 feet. The ergonomic design of the handle helps enhance your grip and the stainless steel retriever mechanism ensures quick and easy grabbing. The high grade aluminum alloy is durable enough to withstand pressure and prevent bending. The product also comes with a dual zip cover which makes it look like another golf club (a nice touch). However, a simple design decision that gave it an advantage also caused it a technical flaw in another aspect. Due to the hollow design of the tube it can accumulate water when submerged. Keep that in mind when using it in water hazards around the golf course. Pros: Tough, long reach and designed for easy use. Well priced. Cons: Be careful when using it on water as the tubing takes some time to completely drain out water from the device. Buy the Callaway 15th Club Golf Ball Retriever here! Another top product for golfers, the Search and Rescue Retriever from JTD Enterprises is one of the most highly rated in this list. It can be purchased at standard price of around $25.68 – $35.99 (depending on size). The Search and Rescue golf ball retriever has a very simple method of retrieval, simply place the head over the golf ball and lift. The rings are made of tough stainless steel, and includes a locking mechanism to ensure that the ball stays in place. It is also coated with weather proof powder to prevent any rust from developing. Another small, but great addition is the inclusion of a dual zip head cover to give it the appearance of a golf club when placed inside your golf bag. Pros: Easy to use mechanism. Cons: Feels a little shaky when fully extended. 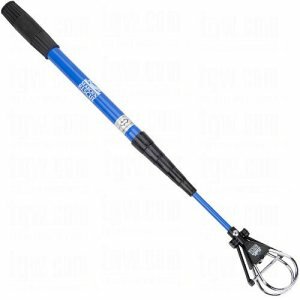 Buy the Search and Rescue Golf Ball Retriever here! Just want the biggest / longest golf ball retriever on the market? 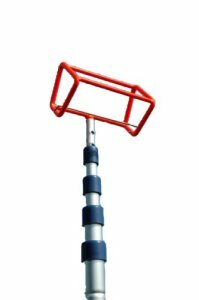 The Search and Rescue 24-foot Golf Ball Retriever is literally the one with the longest extendable reach on this list. As it is exceptionally lengthy it is also price a tad bit higher at over $50. As the name of product suggest, it can extend up to 24 feet, and has a wide head which can scoop up two golf balls at the same time. It uses an internal lock mechanism design to help maintain the desired length. The bright orange color of the head helps maintain visibility when under water. The stainless steel tube (no rusting) makes this the perfect device for picking up golf balls underwater. Pros: Perfect all around golf ball retriever. Cons: The wide head design can look awkward when placed inside the golf bag and sticks out like a sore thumb. 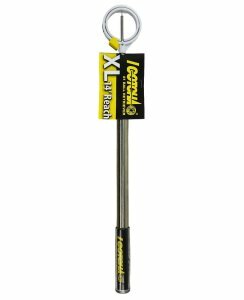 Buy the Search and Rescue 24-Foot Golf Ball Retriever here! The simple design of the Champ Pro-Lite Ball Retriever is actually one of its biggest strengths. The device can be bought for just over $30. The golf retriever can extend up to 9 feet, and can fit easily into your golf bag compartments without trouble. Due to the design of the Champ Pro-Lite you can easily scoop the ball from almost every angle without any trouble. You can even use it to pick up balls out of the hole! True to its name it is also very light and can be carried without hassle. Pros: Durable, compact, light and easy to use. These are the qualities that the best golf retriever should have. Cons: Limited reach compared to other golf ball retrievers on the market. Buy the Champ Pro-Lite Golf Ball Retriever here! Hopefully, our list will help you select the best golf ball retriever according to your needs!